Dagger of the late 19th century beginning of the 20th century, India, ivory handle, and silver case with decorations in silver filigree. DIMENSIONS: Tot 35.5 x 5 cm. - Blade 20.5 cm. handle 11.6 cm. 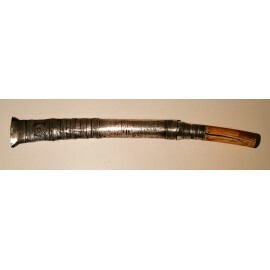 Antiques dagger of the late nineteenth century beginning of the twentieth century, India, ivory handle, and silver case with decorations in silver filigree, nice patina as a whole, small and slight blow in the case but generally good state of conservation.